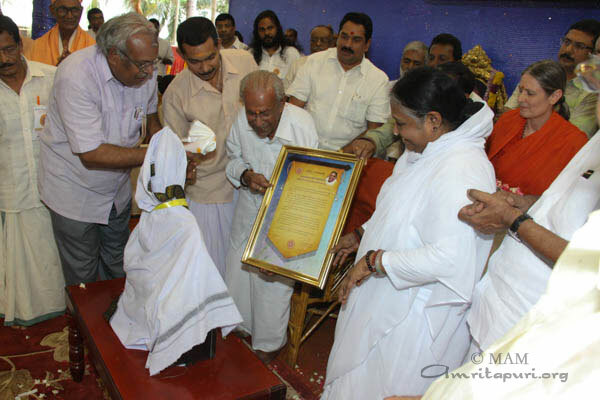 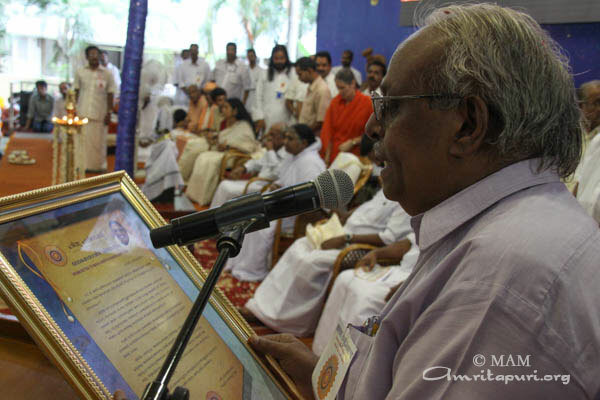 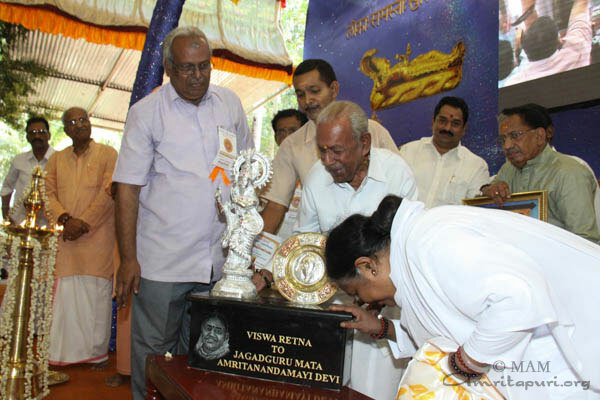 During Amma’s visit to her ashram in Kaimanam, Thiruvananthapuram, Shri Uthradam Thirunal Marthanda Varma, the Maharaja of Travancore and head of the Travancore royal family, presented Amma with the first-ever Vishwaretna Puraskar (Gem of the World Award), bestowed by newly constituted Hindu Parliament. 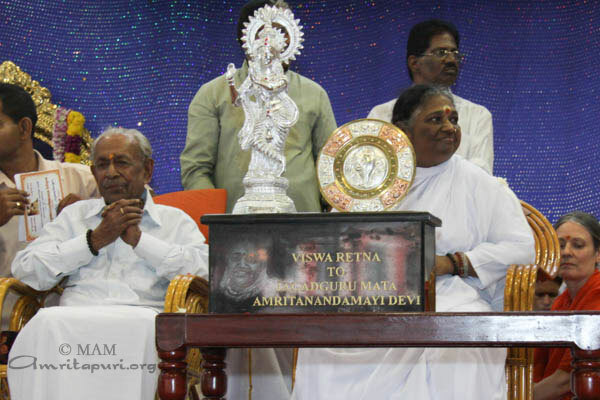 Several officials of the Parliament were on hand to share their reflections in giving the award. 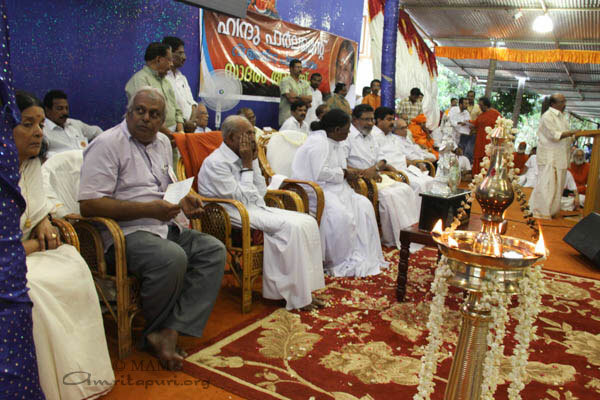 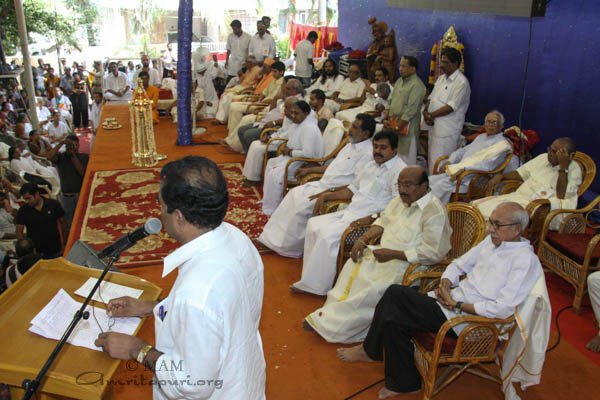 The stage was also populated with a wide-ranging constellation of government officials and other dignitaries, including Assembly Speaker G Karthikeyan, Health Minister VS Sivakumar, Sri Ramakrishna Math (Trivandrum) President Swami Lokahitananda, SNDP General Secretary Vellappilly Nateshan and many representatives from different social organizations around the state. 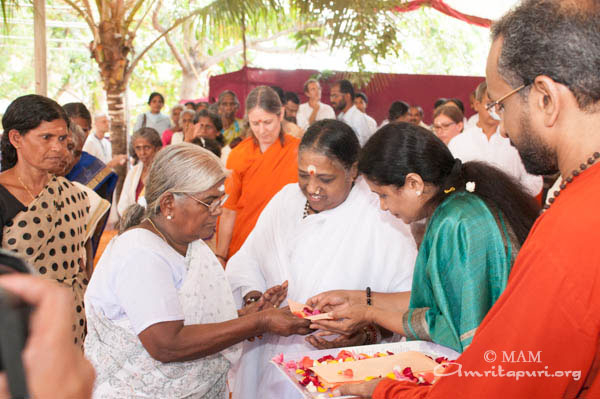 On Amma’s fourth visit to Kanyakumari (India’s southern cape), her public program was held on the grounds on the recently completed Amrita Vidyalayam. 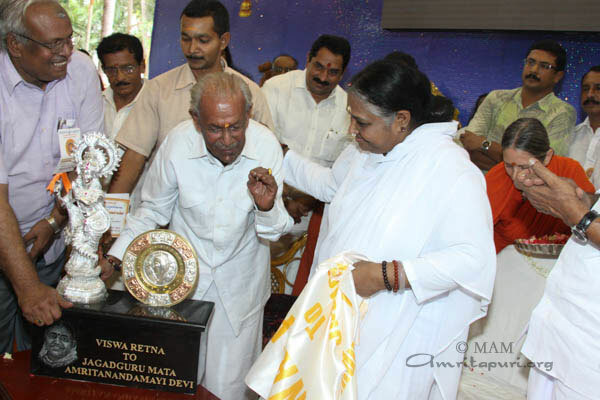 This expansive, beautiful school joins the constellation of Amma’s 56 primary and secondary schools throughout India dedicated to inculcating timeless spiritual values in India’s youth while imparting a top-class academic education – education for living, and education for life. 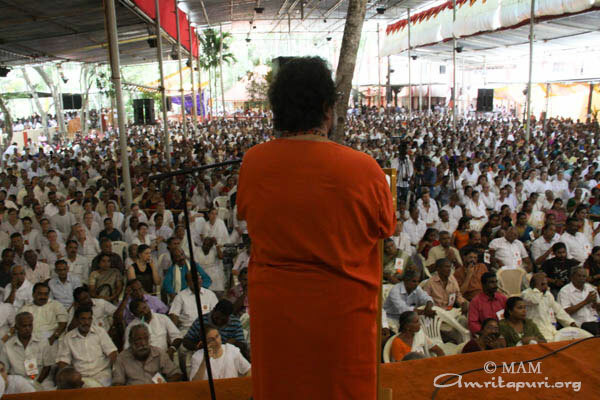 Swami Jagadeeswarananda of Sivananda Ashram, Vivekananda Kendra Vice President Nivedita as well as MLA Pon Radhakrishnanan, Swami Chaitanyananda of Vellimalai Ashram, the District Magistrate and others shared the dais with Amma. 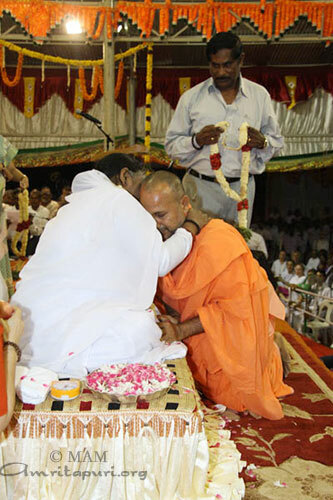 In his remarks, Swami Chaitanyananda said, “Out of compassion, Amma travels around the world, blessing all of us. 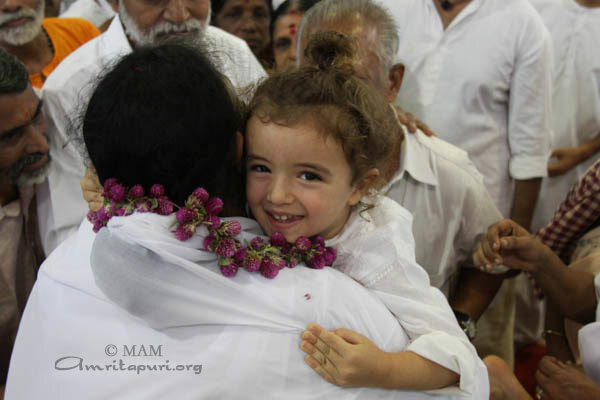 (“Parvati is the Mother, Shiva is the father, the relatives are Shiva’s devotees, the native place is all the three worlds”). 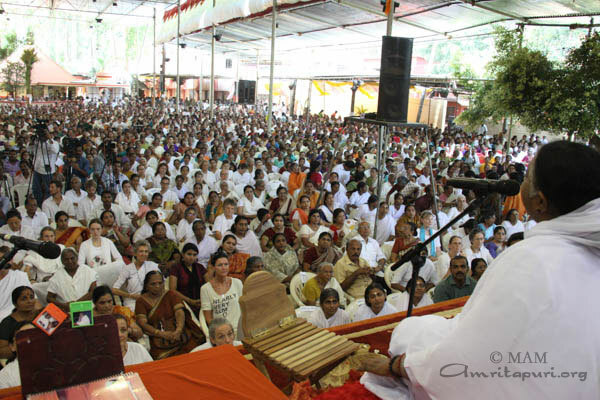 I am remembering this sloka by Shankaracharya. 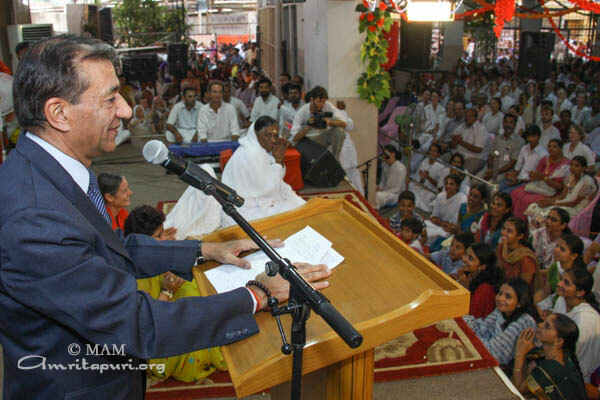 When I studied that I realised that it will be possible only if you live in the highest plane of consciousness. 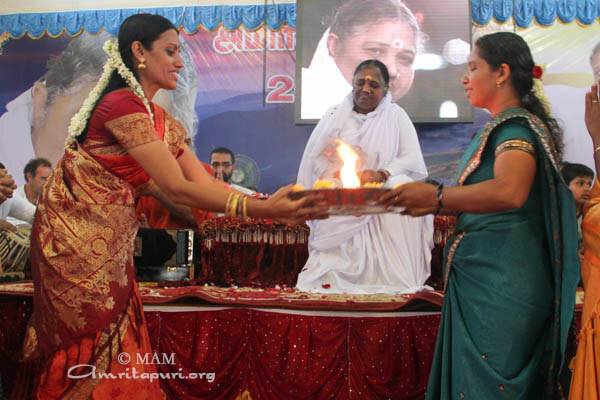 Now as Parvati Devi, Amma has come bless all of us. 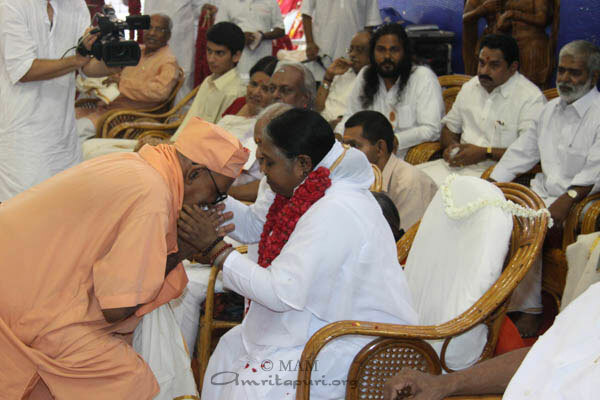 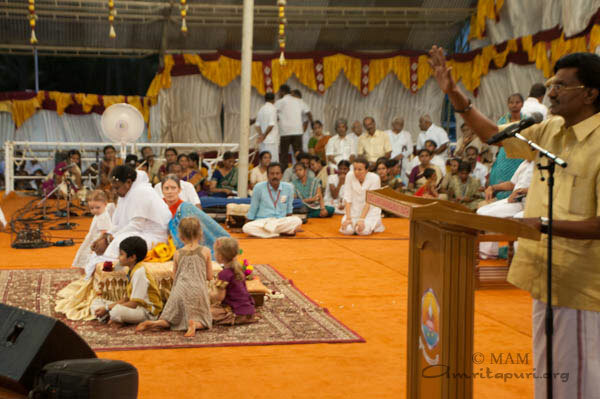 Amma answered his prayer, proceeding to embrace the children of Kanyakumari one by one. 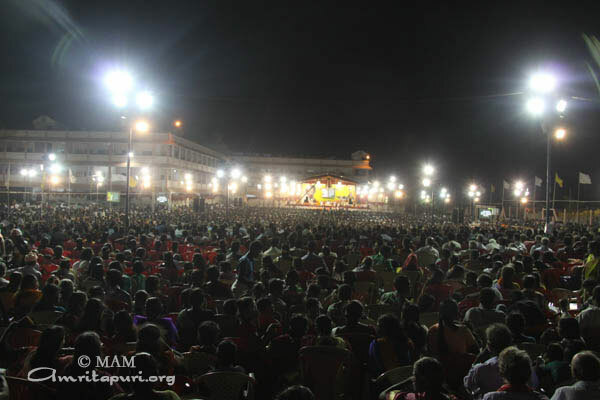 Despite the massive size of the crowd, the assembled devotees were remarkably peaceful – as if they knew that Kanyakumari herself was among them — having reached her, they were in no rush to go anywhere. 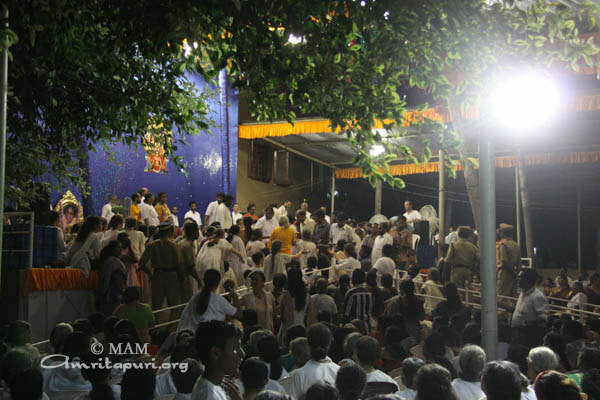 They listened closely to her satsang and bhajans, and waited patiently to receive her darshan all through the night. 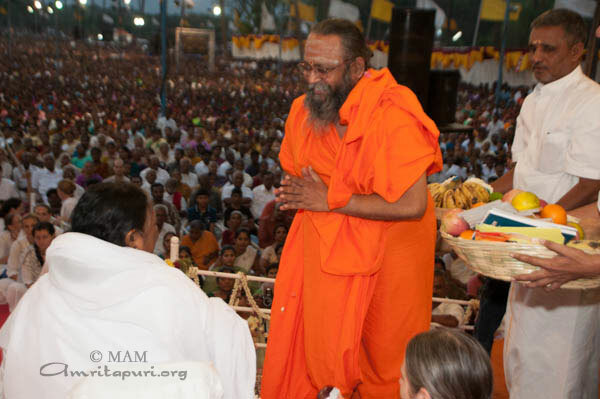 Her darshan went on until 9:30 am the following morning. 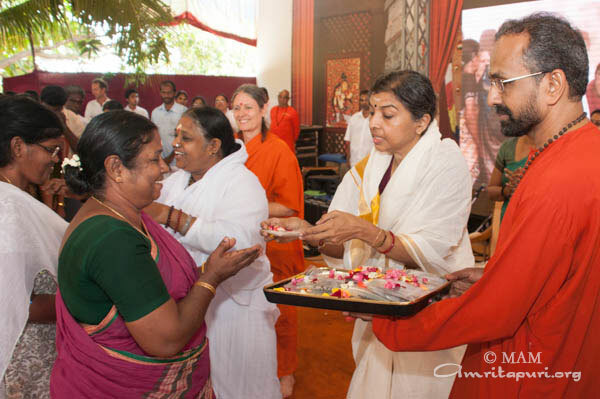 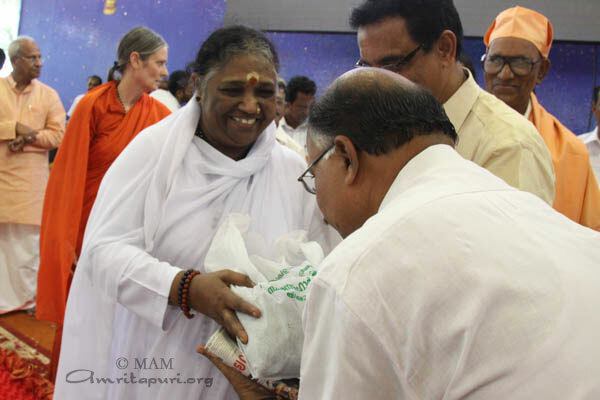 On arrival in Chennai, Amma continued the tradition of the tour, serving Prasad to the assembled devotees, as well as sharing jokes, spiritual stories, and practical advice with them. 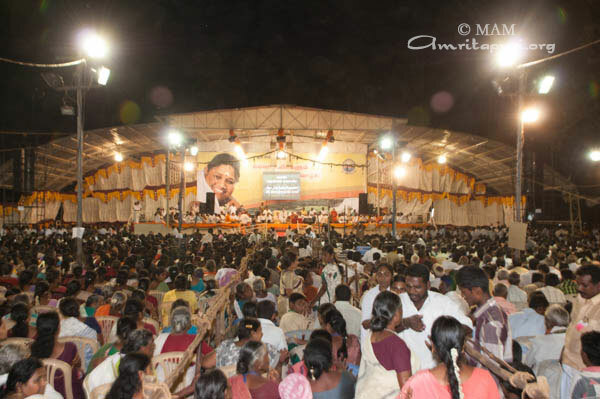 To the delight of the devotees, Amma made several comments in their mother tongue of Tamil as well. 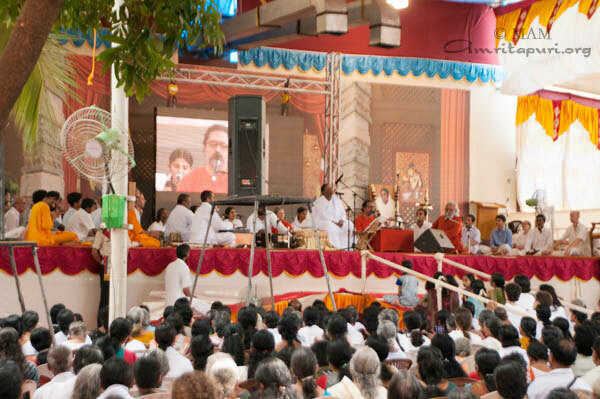 Continuing a second tradition that has unfolded on this tour, Amma gave many practical instructions to the brahmacharis in charge on how to make adjustments to the programme venue in order to accommodate more devotees and make them more comfortable. 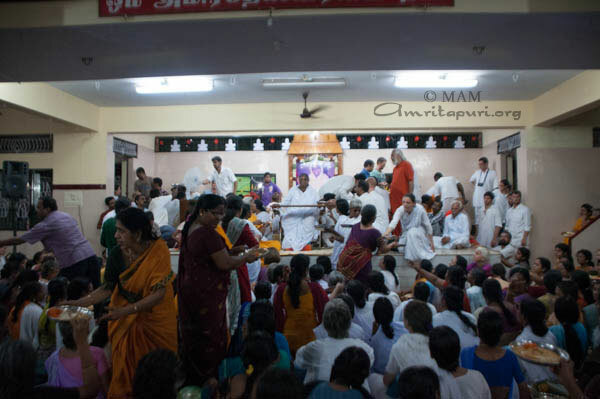 In the case of the Chennai ashram, an old bookstall structure was demolished over night in order to make space for more of Amma’s children to sit in the shade and participate in her programme. 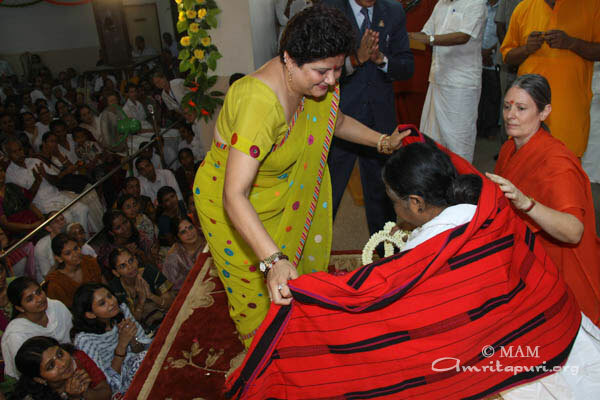 During Amma’s programmes in Chennai, His Excellency the Governor of Nagaland, Dr Ashwini Kumar met Amma and participated at the 23rd Annual celebrations of the Chennai Brahmasthanam. 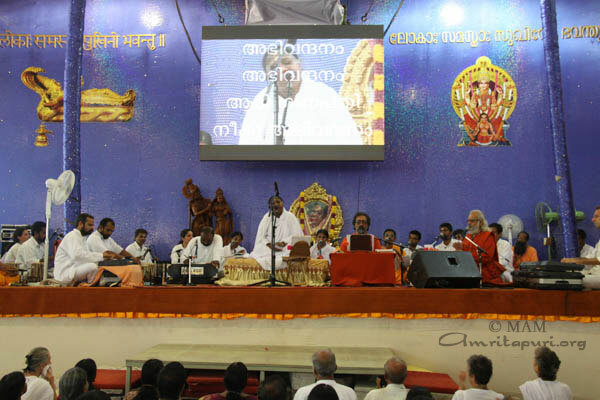 Various renowned Karnatic musicians like Dr R Ganeshan, Mahesh Vinayakram, Neyveli Santhana Gopalan, Malgudi Subha Umayalapuram Sivaraman (Mridamgam), Lalgudi GJR Krishnan (Violin), N Ravikran (Chitra Veena), Uma Shankar and team (Ghatam), Anuradha Sriram & Sriram Parashuram (Hindusthani calassical), Udayalur Kalyanaraman (Sampradhaya bhajan) performed for Amma as she gave darshan. 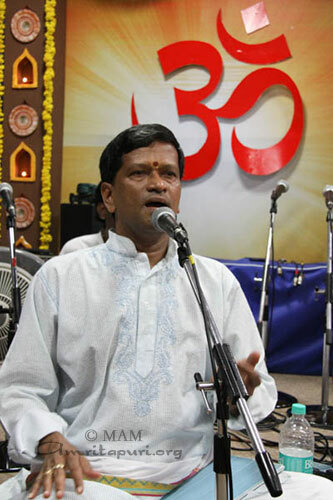 “It is believed that Nandikesha plays Mridangam in front of Lord Shiva and Parvati. 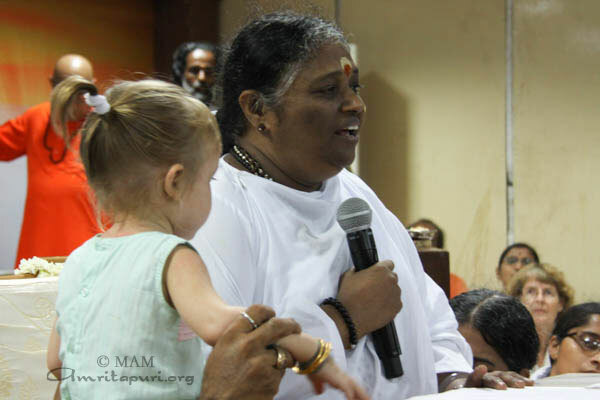 I feel like the same when I play in front of Parashakti, our Amma. 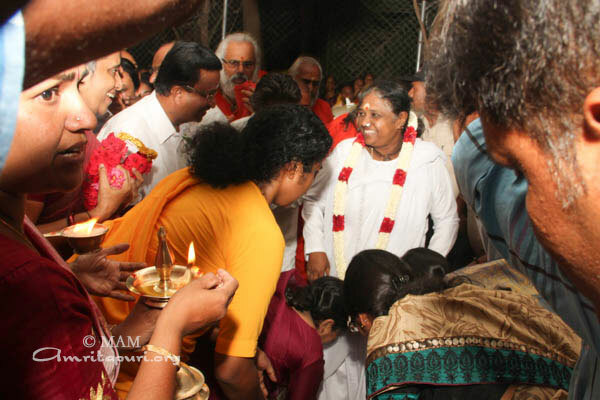 I would like to come and play for Amma’s 60th Birthday. 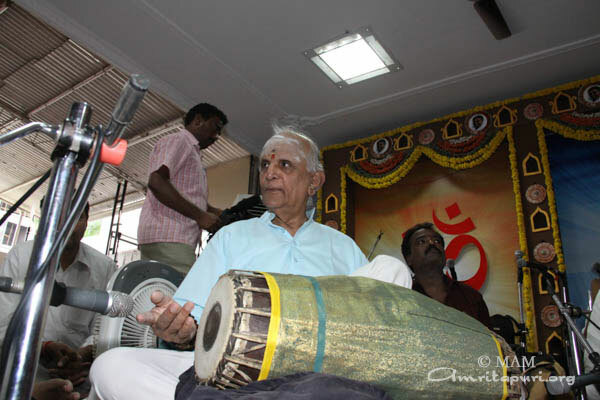 Amma, please bless my family and my art and all of us” said Umalaylpuram Shivaraman on the mike after his 30 minute performance on Mridangam. 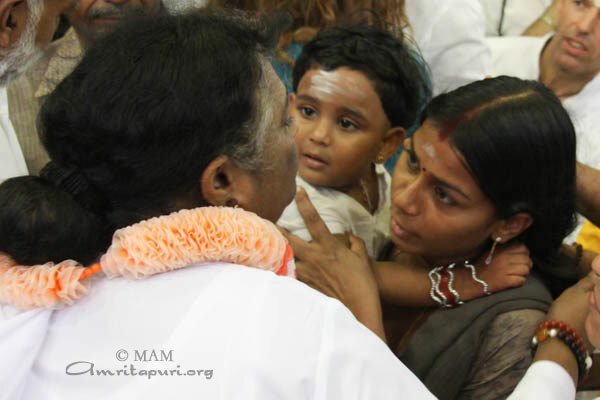 During the two-day celebrations Amma gave darshan to countless people who gathered despite the sweltering heat in Chennai. 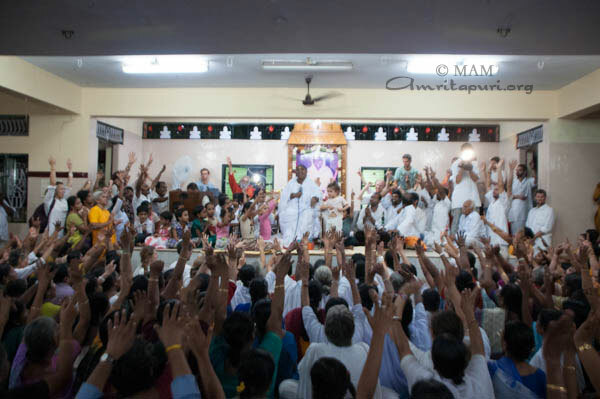 For nearly 48 hours continuously, the Chennai ashram was packed to overflowing with Amma’s children who patiently bore the crowds and the heat in order to enjoy a few moments in her arms and imbibe her divine energy. 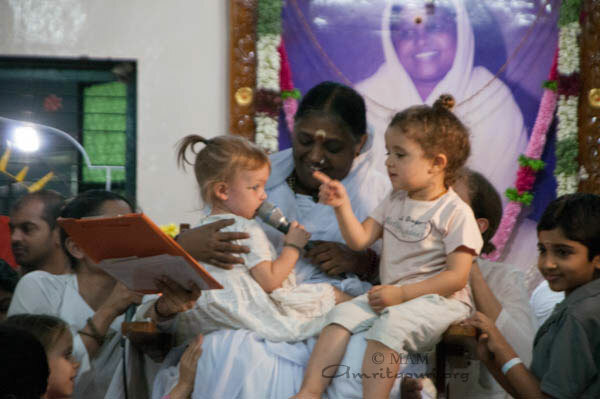 Amma’s children know the secret to true happiness, as taught by Amma – air-condition the mind, taking refuge in the shade of Amma’s blissful presence. 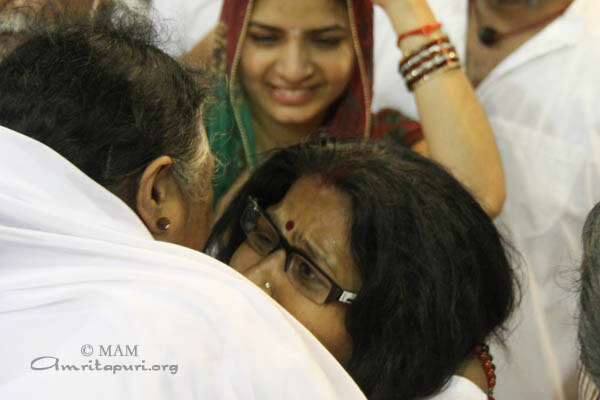 Darshan ended after 5:00 in the morning as Amma concluded her darshan by singing joyfully amidst her children. 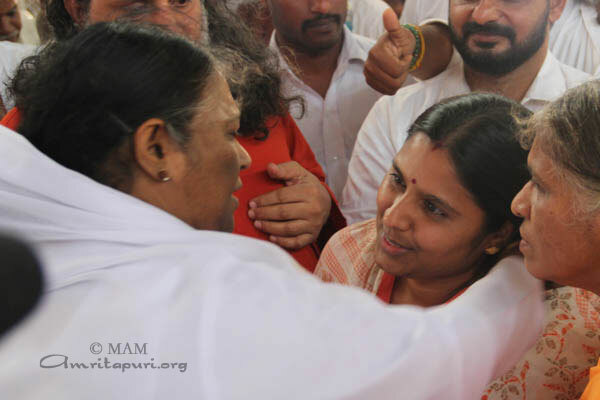 En route to Puducherry, Amma had stopped by the road to gather with the tour group. 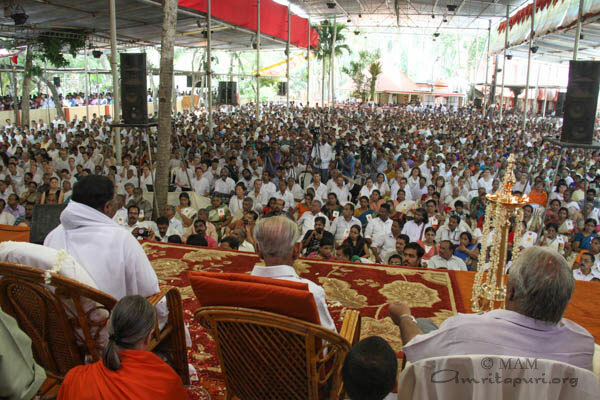 As the 14th of April was Vishu, the New Year according to the calendar of Kerala, Amma wanted members of the group to share their perspective on the meaning and importance of Vishu and its associated traditions. 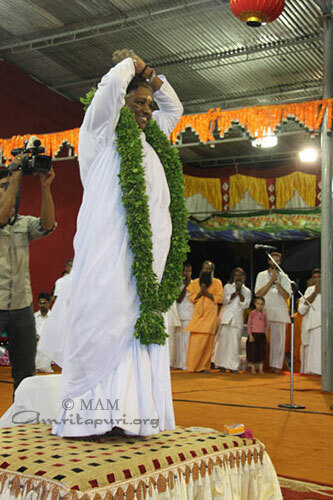 Specially mentioned was the tradition of the parents ensuring that the children’s first sight when they open their eyes that morning is an image of Lord Krishna along with different fruits and vegetables. 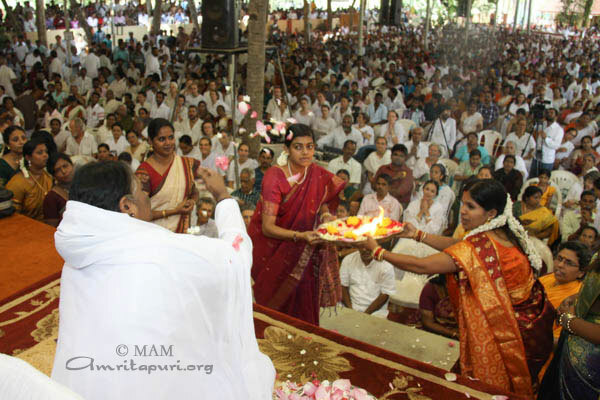 Next to the image of the lord will be placed a mirror, symbolizing the fundamental principle of Sanatana Dharma that the Creator and creation are one and the same – that God dwells within each of us. 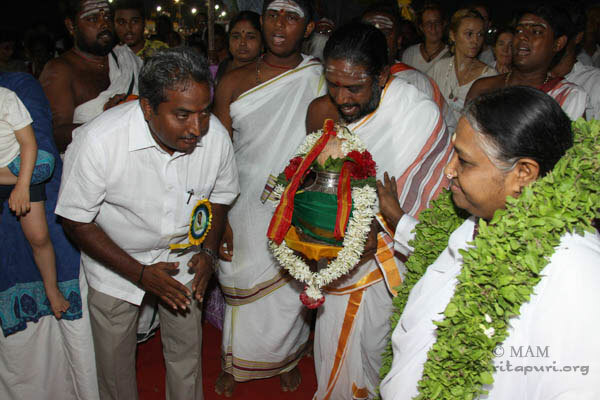 This was Amma’s third visit to Puducherry. 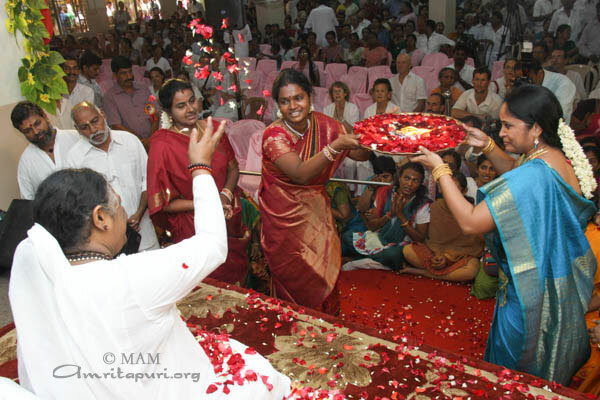 She was returning after four years, and the throngs of devotees gathered hours before her arrival, eager to welcome her back. 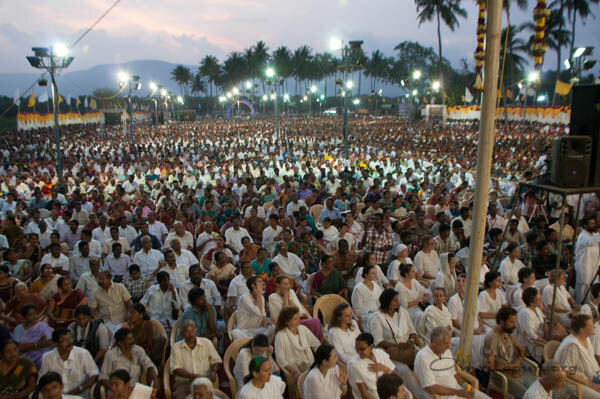 Less than 500 square kilometers in size, Puducherry is also home to a large number of French expatriates. 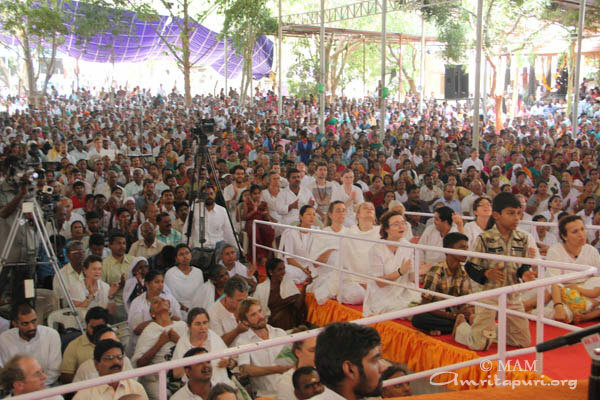 As such there were many French people and other foreigners among the devotees who came for Amma’s darshan. 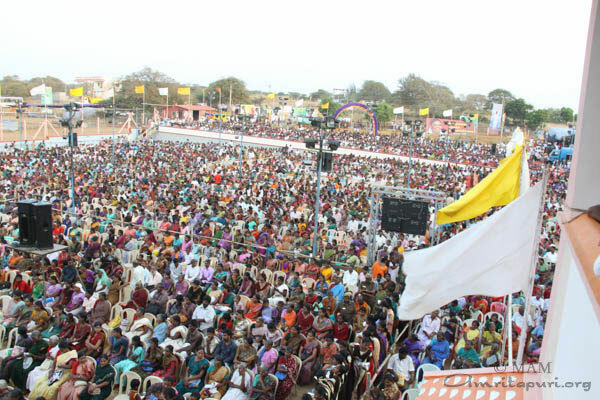 Near the sea, the relatively cooler climate was also a breath of fresh air for the tour group after the blistering heat of Madurai. 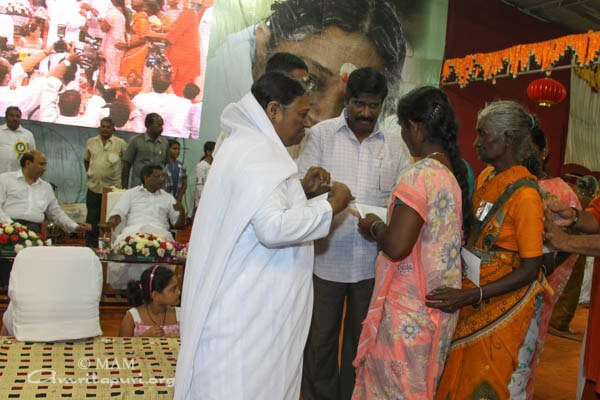 As part of the programme, Amma expanded the Amrita Nidhi pension project to benefit widows, the differently abled and others living in poverty in Puducherry. 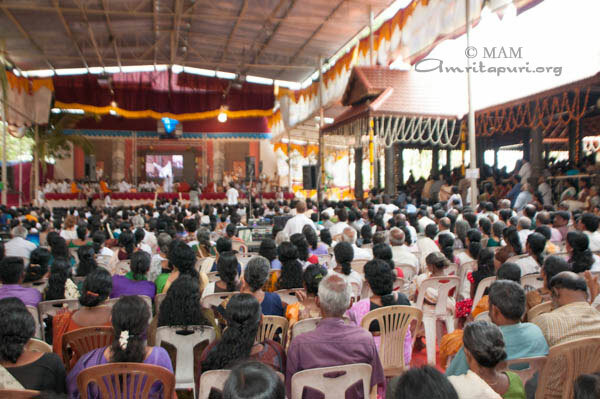 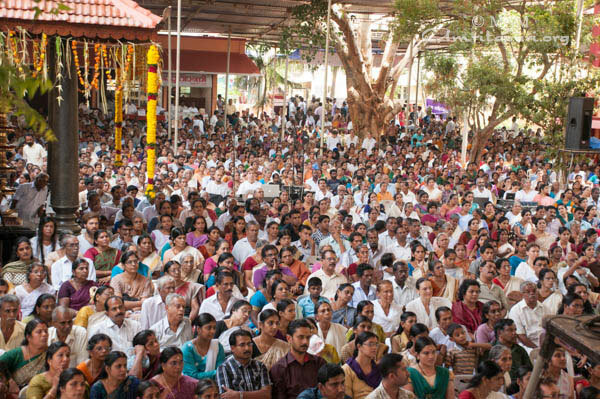 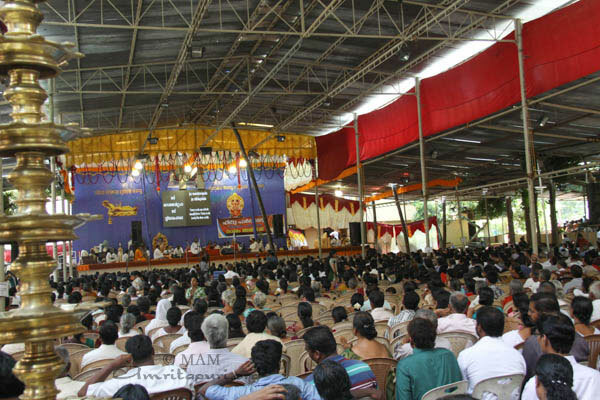 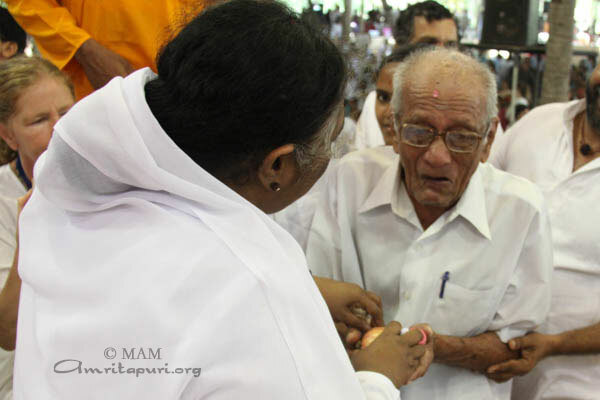 For them and all the devotees gathered for Amma’s programme, it was an auspicious start to the New Year indeed. 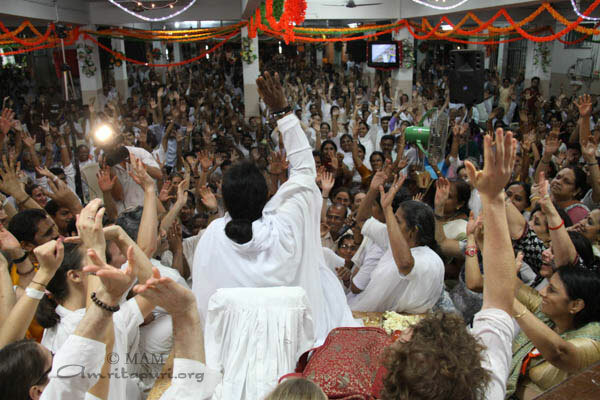 The darshan finally ended after 8:00 am the next day, and Amma and the tour group moved on to Chennai. 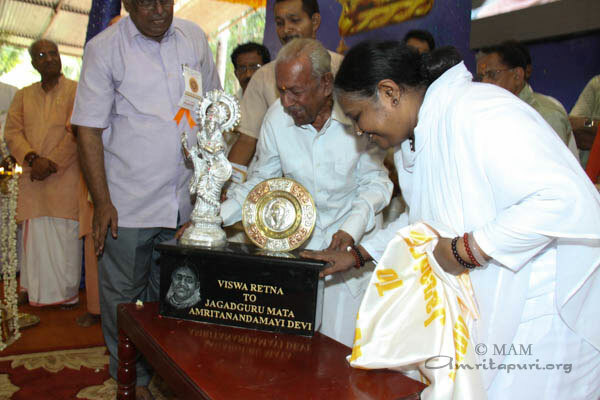 It was Amma’s first visit to Kambam, a small town located in the Theni District of Tamil Nadu. 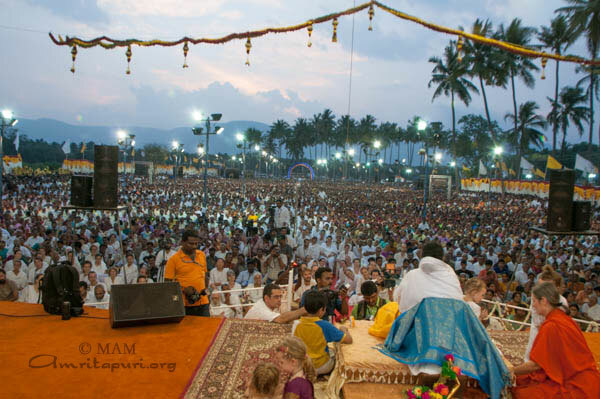 Not far from Kerala’s Idukki district and Periyar river, Kambam is a valley surrounded by hills, in which agricultural activities is the main resource. 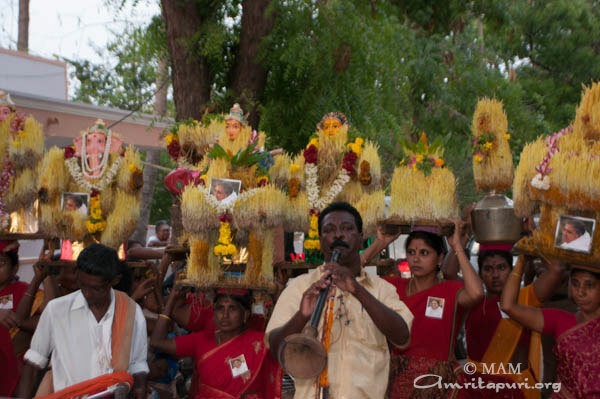 The name Kambam has derived from the famous temple of Lord Narayana (Cumbaraya Perumal) around which the town has been built. 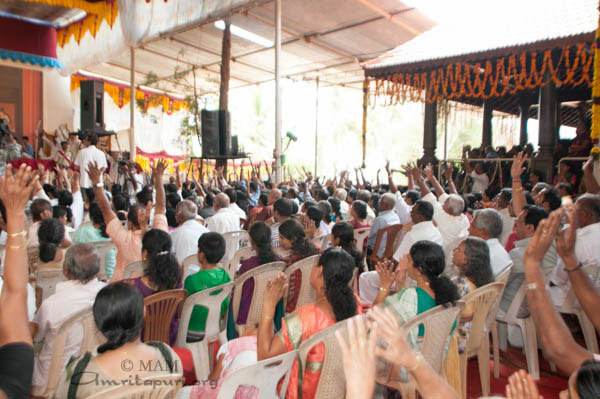 Amma’s visit was a big event for all the people of Kambam, from early afternoon they started flocking to the outdoor program venue, with their families and children. 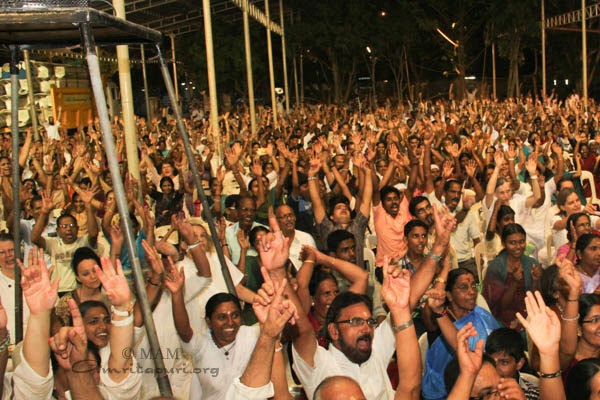 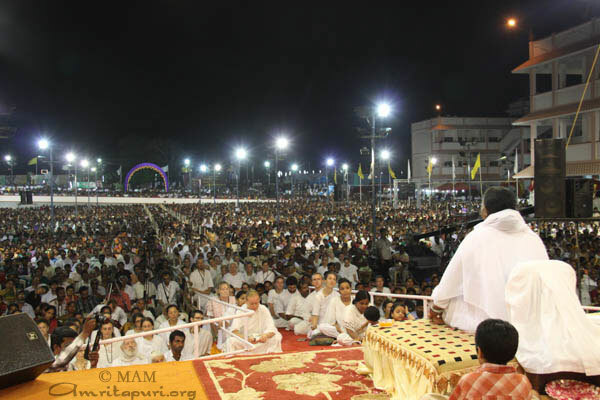 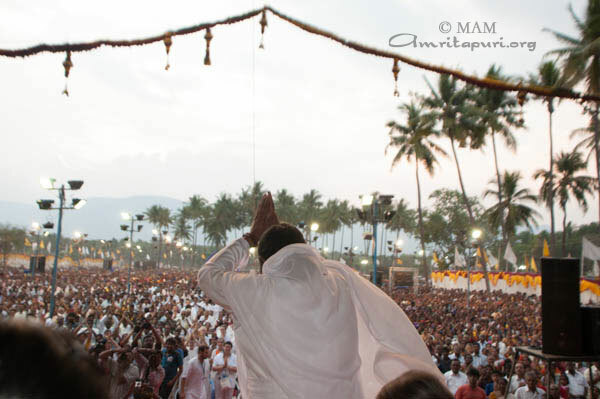 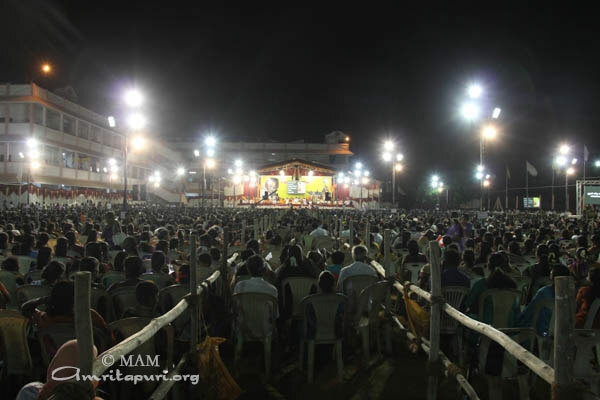 When Amma reaches around 6:30pm, there was a sea of humanity gathered at the place. 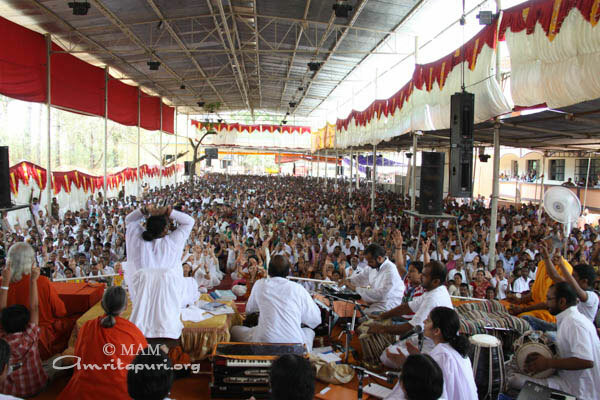 It was a delight to witness the innocence and devotion of this crowd. 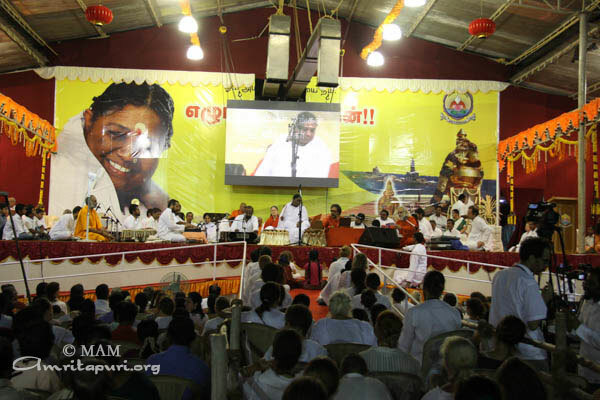 After the official function, Amma sang beautiful bhajans followed by a satsang translated by Swami Ramakrishnananda, and a meditation guided by Amma herself using the Tamil language! 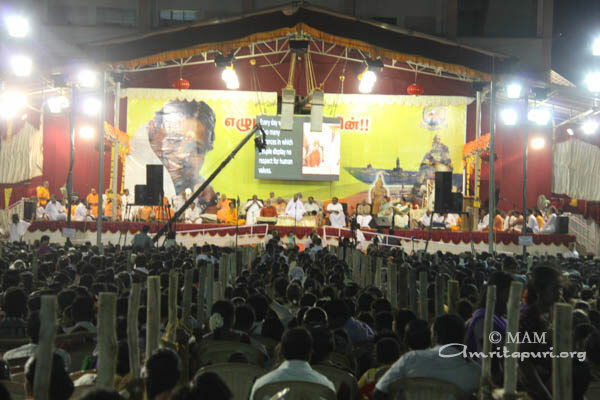 When darshan started a huge crowd was facing Amma and the stage. 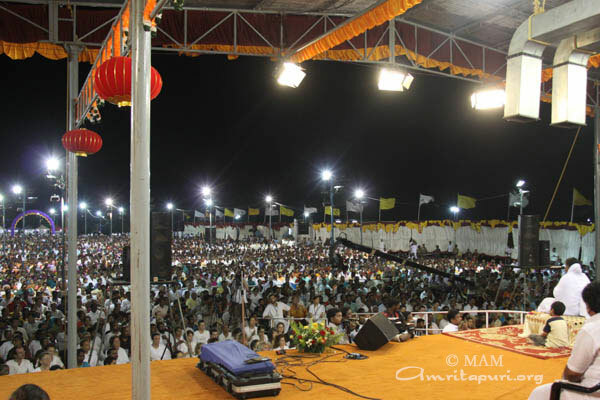 She literally started ‘swimming in the sea of people’…, Her loving, blessing and hugging covered the whole night, up till around 9:45am the next morning! 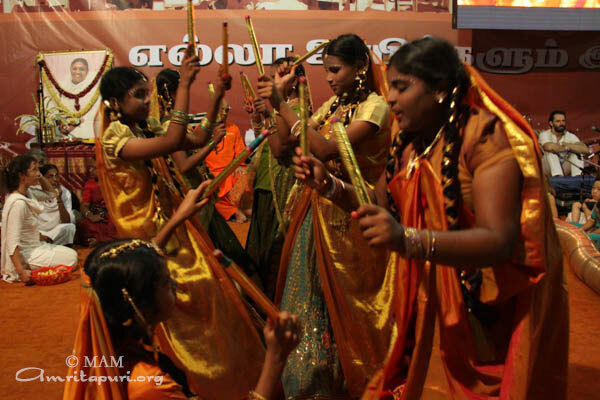 Simultaneously, all night long, various traditional dances and performances, particular to the area, were held on the stage. 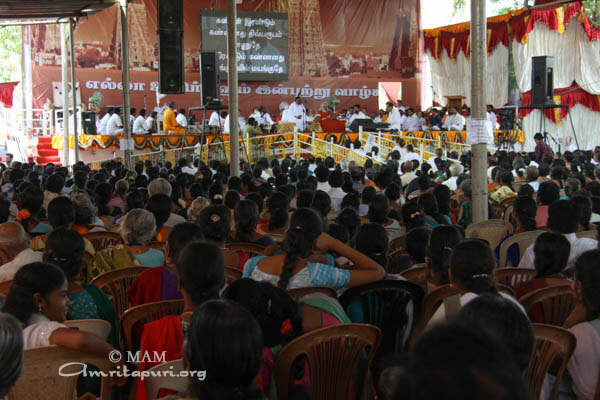 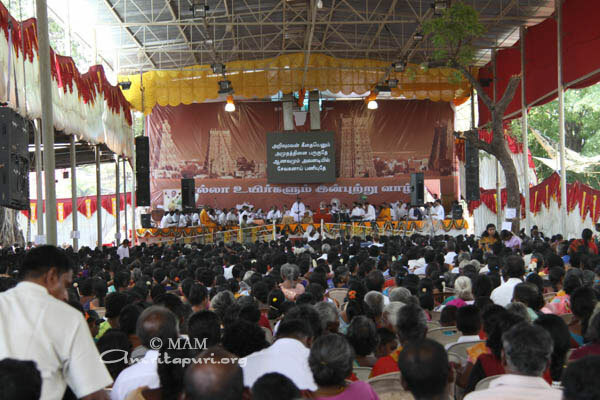 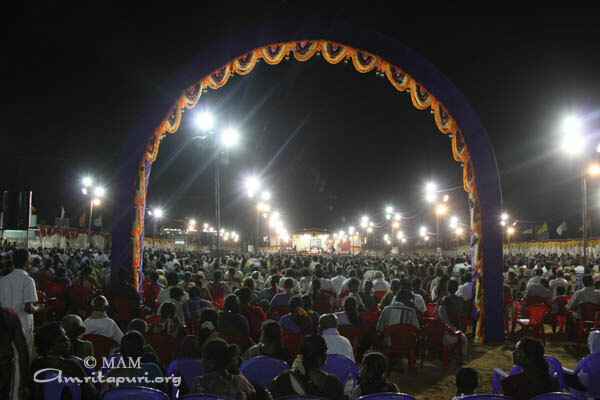 As soon as Amma finished darshan and left the stage, she gave instructions for the 600 members of her accompanying traveling ashram to pack and move to the next city– Madurai. 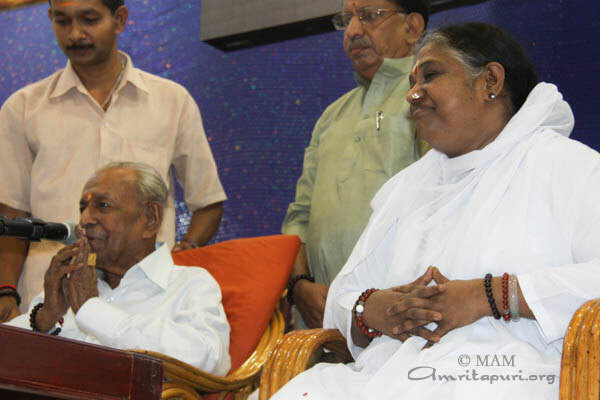 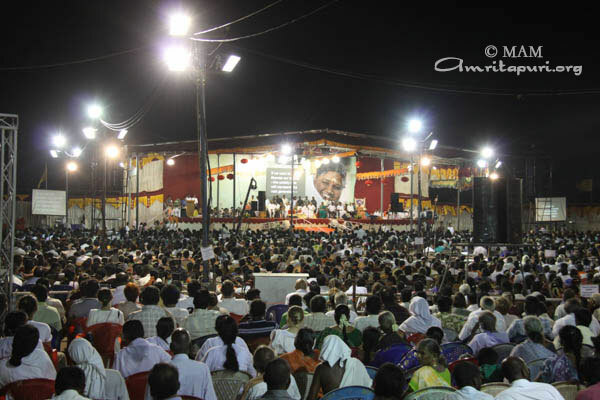 On the first day of the programs official ceremonies were conducted as Amma reached the stage in Coimbatore. 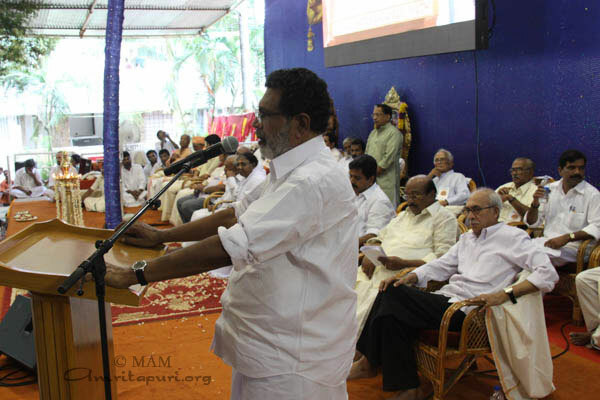 Tamil Nadu State Agriculture Minister S. Damodaran released the book, Spirituality and India in Tamil. 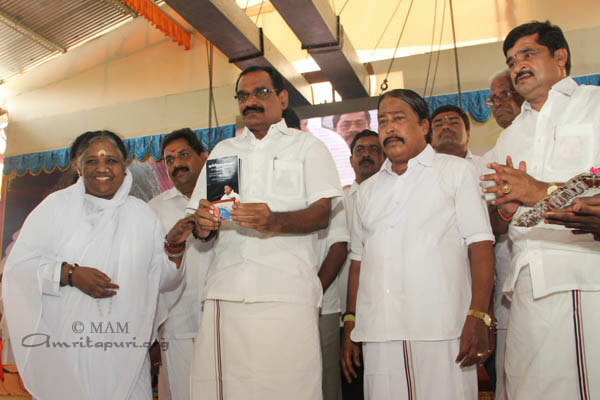 Tamil Nadu MLAs, T. Malaravan and Arukutty Gounder released the souvenir of the Brahmasthanam Celebration. 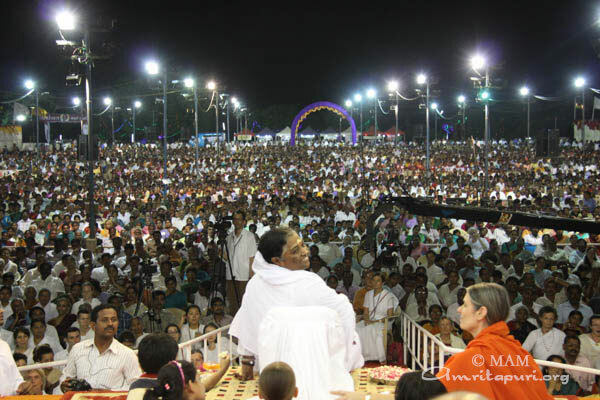 Bhajans, Amma’s satsang, guided meditation and prayers followed before Amma started giving darshan to one and all. 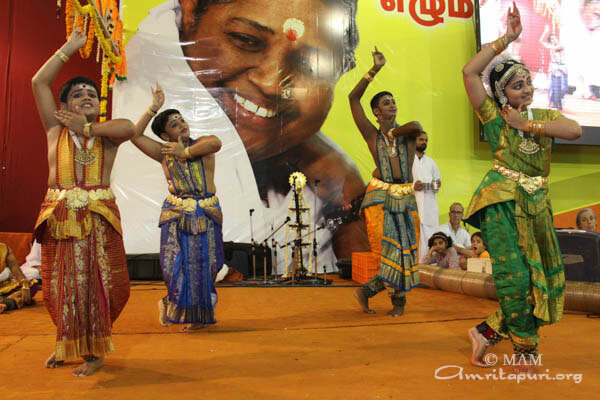 The manasapuja was lead by Amma in Tamil. 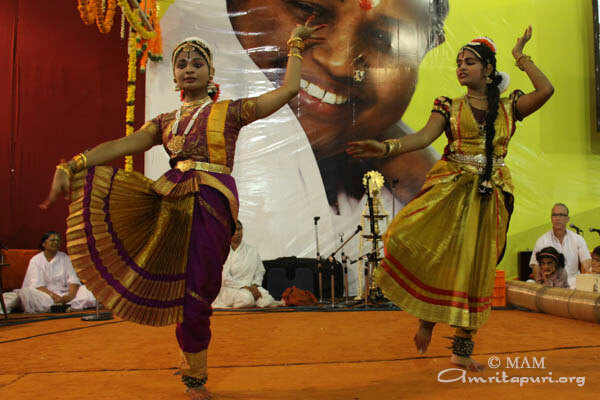 On both evenings of the Coimbatore programs, devotees from Ooty shared traditional dances to the tune of songs to the Divine Mother, delighting one and all. 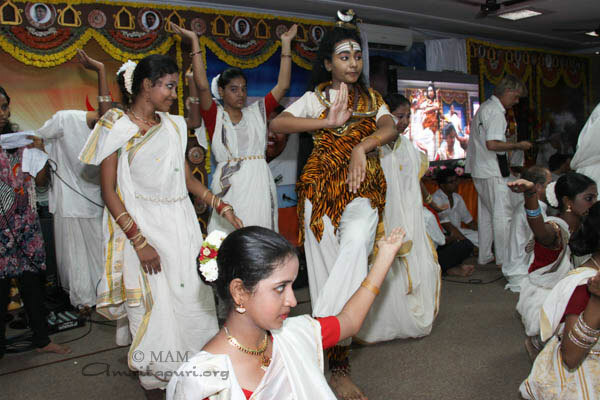 Students of Amrita Instituions also presented various cultural programs. 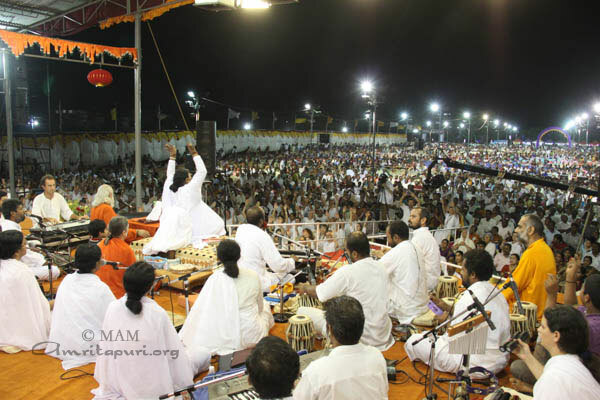 The next day, Amma’s darshan finished at 4:30 am with Amma extending her time of presence on the stage to sing sprightly bhajans with one and all. 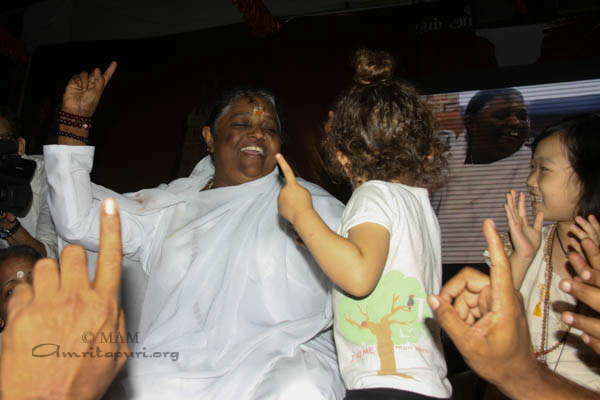 Happiness and joy filled the hearts of all. 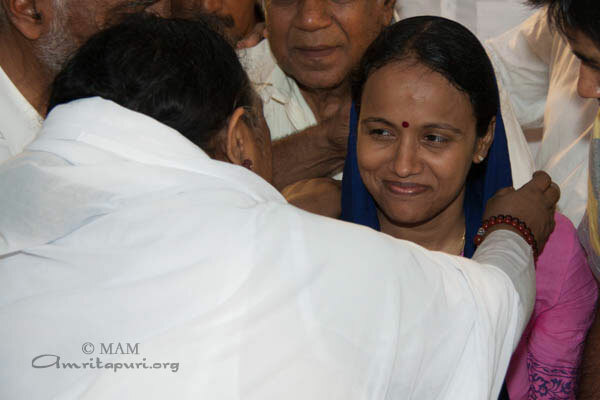 Like it had been for the previous 3 stops of the Bharata Yatra, upon her arrival Amma went straight to the unfinished stage as soon as she reached the place. 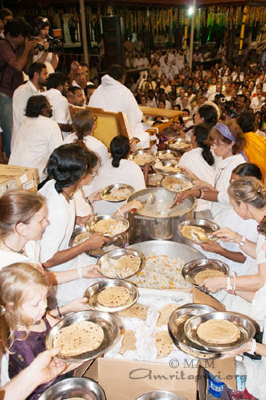 Food was served to all present. 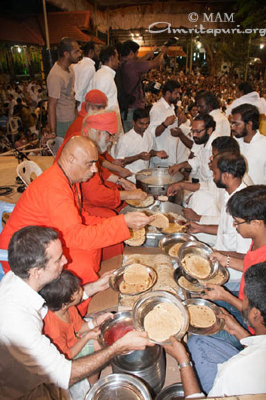 Behind Amma two crews of plate fillers worked at super speed to have the plates ready for Amma to pass on to the public. 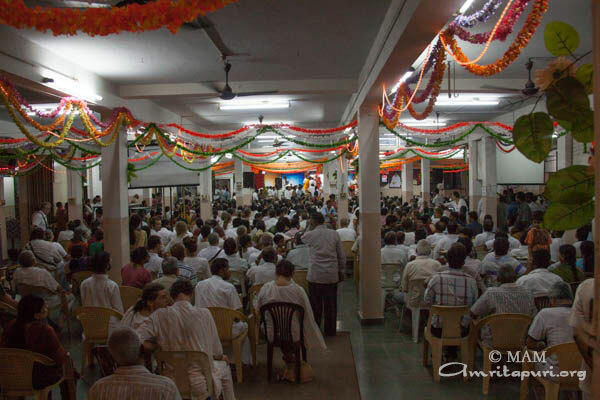 After the prayers and while all started eating the delicious Prasad dinner, Amma offered the chance for the people present to share their feelings and stories. 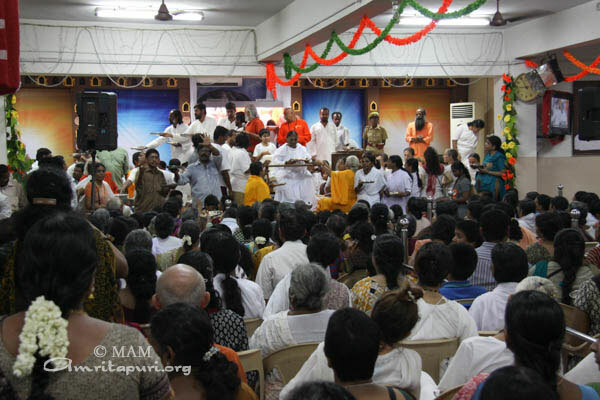 This ended with beautiful bhajans led by Amma. 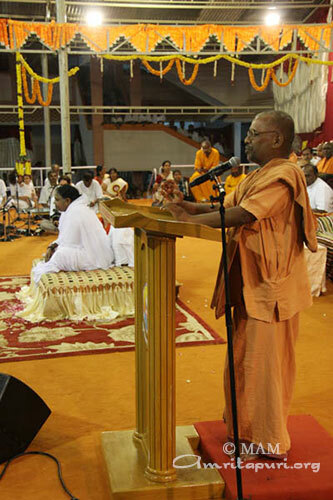 On the first day of the Brahmasthanam festival, the guests of honor on the stage were Indira, District Judge, MP Dinesh Superintendent of Police, Indira Krishna Kumar PMG. 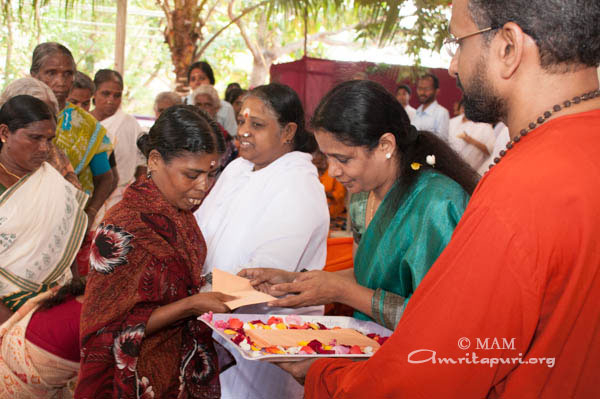 Amrita Nidhi pensions were handed over to new recipients, as well as seeds for organic farming under the Haritamritam programme. 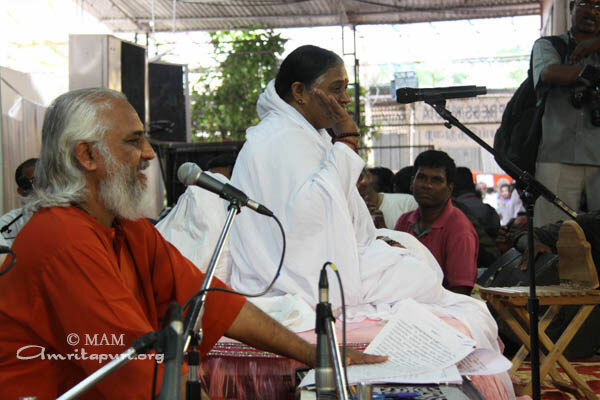 This was followed by bhajans, guided meditation, a satsang by Amma and prayers. 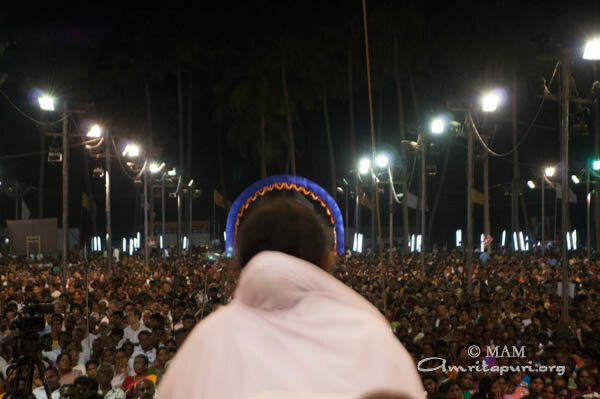 On the second day, darshan ended at 4am, with Amma singing enthusiastic bhajans to the great delight of the devotees. 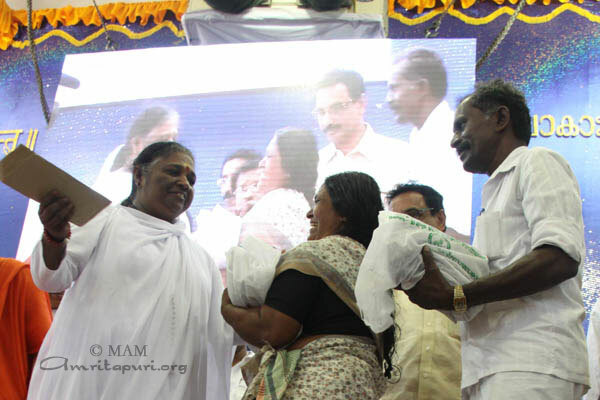 Earlier as soon as Amma reached Palakkad, she walked to the stage and she started passing out prasad dinner plates for all those present. 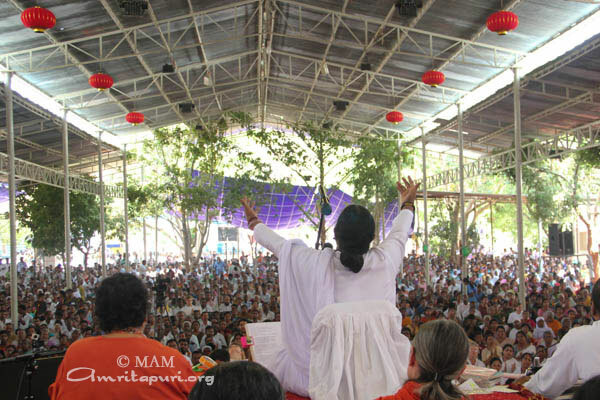 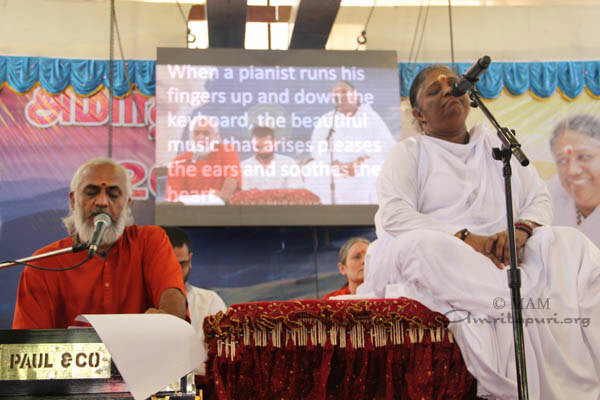 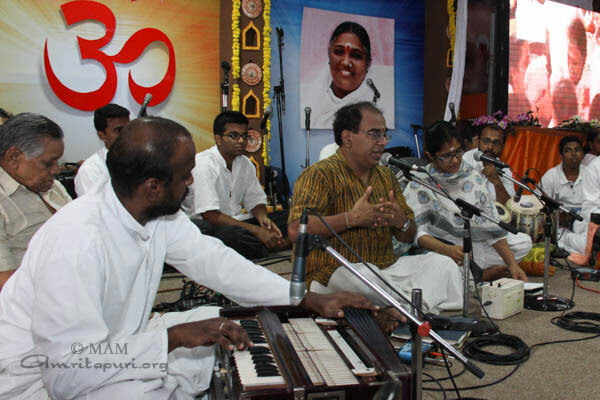 During this long process, using the microphone, she was talking to everyone, giving advice and instructions, and inviting the devotees to share their feelings and stories over the microphone. 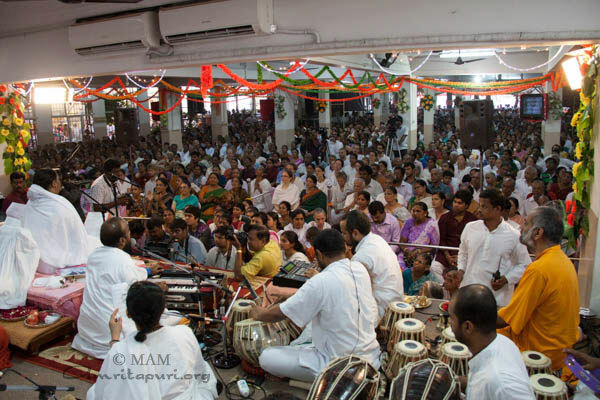 Afterwards, Amma led everyone in enthusiastic bhajans. 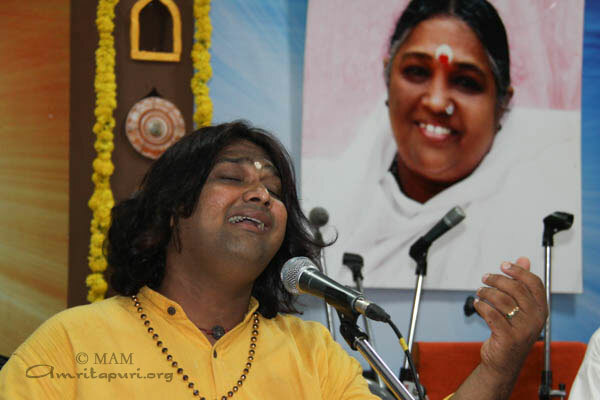 Swami Amritaswarupanada Puri to visit Bahrain, Kuwait and Dubai from 9th to 20th April. 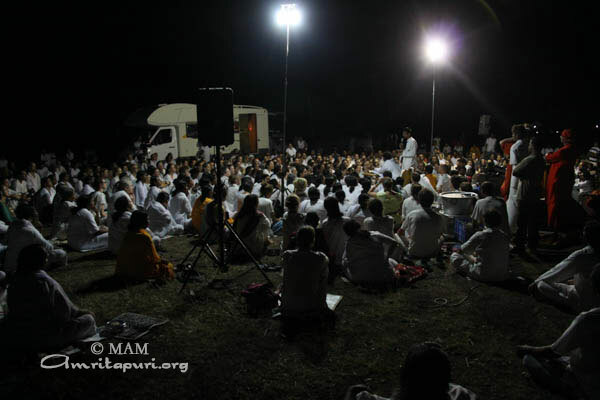 9th April 2013	7:30 p.m. to 9:30 p.m.
10th April 2013	7:30 p.m. to 9:30 p.m.
11th April 2013	7:00 p.m. to 9:00 p.m.
12th April 2013	7:00 p.m. to 9:00 p.m.
14th April 2013 7:30 p.m. to 10:00 p.m.
15th April 2013	7:30 p.m. to 10:00 p.m.
17th April 2013, 7:30 p.m. to 10:00 p.m.
18th April 2013, 7:30 p.m. to 10:00 p.m.
19th April 2013, 7:30 p.m. to 10:00 p.m.